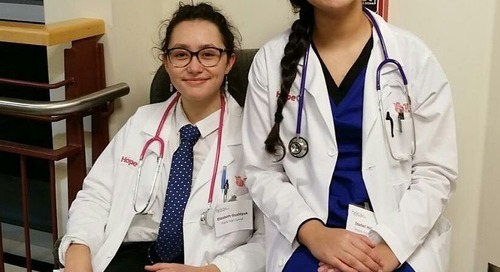 We are excited to announce that enrollment is open for our new before-school "Launch" program that will be offered to primary school students on late-start Wednesdays next year. 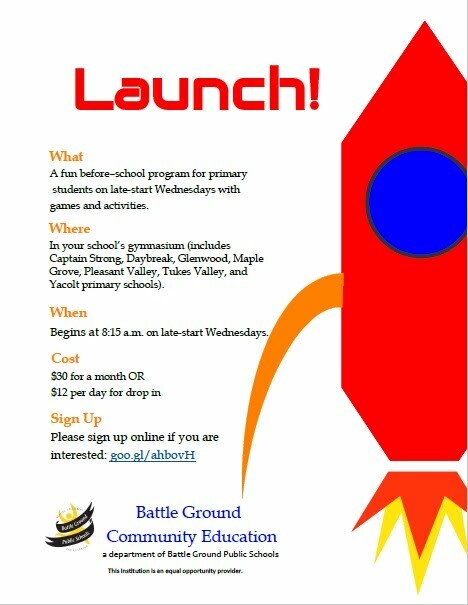 Brought to you by Battle Ground Community Education, a department of Battle Ground Public Schools, Launch is a fun way for your child to begin their day on late-start Wednesdays. Next school year, beginning on Sept. 4 and continuing through the end of May 2019, all district schools will start one hour late on Wednesdays for teacher collaboration. Late-start Wednesdays will replace the early release days that were used for professional development (some early release days will still occur for parent-teacher conferences and end of semester). Late-start Wednesdays will allow all teachers to have consistent time to work together to improve student learning. The Launch program will be held in the gymnasium at your child’s primary school. Parents can drop off their children as early as 8:15 a.m. on late-start Wednesdays for activities and games. Each Launch morning will begin with low-key activities such as reading, puzzles, coloring or games. The energy level will steadily increase to help prepare your child for school. Two payment options are available: parents can choose to pay $30 per month, or $12 per day for drop-in. If you are interested in having your child participate on late-start Wednesdays next year, please visit Community Education’s website, and then choose “Launch Program” from the class options listed in the text box on the left side of the screen.